« Will Brown propose paying judges pension debt? Gov. Brown wants state workers to begin paying half the cost of their future retiree health care — a big change for workers making no payments for coverage that can pay 100 percent of the premium for a retiree and 90 percent for their dependents. The governor also wants state workers to be given the option of a lower-cost health insurance plan with higher deductibles. The state would contribute to a tax-deferred savings account to help cover out-of-pocket costs not covered by the plan. More funding and lower premium costs are key parts of a plan to eliminate a growing debt or “unfunded liability” for state worker retiree health care, now estimated to be $72 billion over the next 30 years. As Brown proposed a new state budget last week, he pointed to a chart showing retiree health care debt at a crossroads. If no action is taken, the debt by 2047-48 grows to $300 billion. Under his plan, the debt by 2044-45 drops to zero. 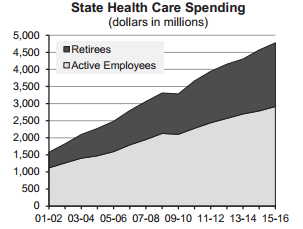 State worker retiree health care is one of the fastest-growing costs in the state budget. Next fiscal year its cost is $1.9 billion (1.6 percent of the general fund), four times more than paid 15 years ago, $458 million (0.6 percent of the general fund). Brown’s plan would save taxpayers money by switching from “pay-as-you-go” funding, which only pays the health insurance premiums each year, to pension-like “prefunding” that invests additional money to earn interest. Prefunding is widely urged as a way to cut long-term costs. The No. 1 recommendation of a governor’s public employee retirement commission in 2008 was prefunding retiree health care. The California Public Employees Retirement System expects investments to pay two-thirds of total pension costs. The governor’s retiree health care plan is expected to save nearly $200 billion over the next 50 years. When fully phased in, Brown’s plan is estimated to cost the state $600 million a year in addition to the payment of premiums. The amount is half of the “normal” cost of future retiree health care earned by active workers during a year, excluding debt from previous years. State workers would contribute the other half of the normal cost, bringing the total to $1.2 billion. With $1.9 billion for premiums, the total is still well short of the $5 billion a state controller’s report last month said is needed for full funding. Brown’s finance department said its cost estimates were developed with the same actuaries used by the controller, but a different scenario. Though not included in the estimates, California State University also is expected to prefund retiree health care. In an annual “fiscal outlook” last November, nonpartisan Legislative Analyst Mac Taylor urged the Legislature to consider using the new Proposition 2 debt payment fund to pay state worker retiree health care debt. Brown’s proposal to have workers help pay for retiree health care follows some large cities, such as San Jose and San Francisco, and his earlier experience with the Legislature. The California Highway Patrol, giving up pay raises for several years, contributes 3.9 percent of pay to the state retiree health care investment fund with a state match of 2 percent of pay. Physicians, dentists and podiatrists (bargaining unit 12) and craft and maintenance (bargaining unit 16) contribute 0.5 percent of pay with no state match. The governor’s proposal last week does not say how much of a bite from state worker paychecks will be needed to yield a total of $600 million, half of the retiree health care normal cost. 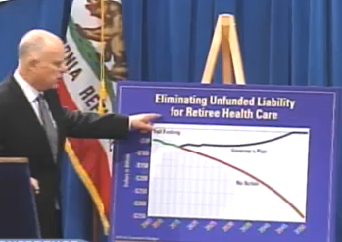 Brown’s first proposal in the 12-point pension reform did not include prefunding state worker retiree health care. But the new plan last week has all three of the retiree health care proposals that were in the first plan. Ten years of service is needed to be eligible for retiree health care, beginning at 50 percent coverage and increasing to 100 percent after 20 years of service. For new hires, the plan pushes back the thresholds for new hires to 15 and 25 years. The state pays more of the health care premium for retirees (100 percent retirees, 90 percent dependents) than for active workers (80 to 85 percent workers, 80 percent dependents). For new hires, the plan prevents a higher subsidy in retirement than received on the job. CalPERS is asked to “increase efforts to ensure” seniors eligible for Medicare are switching to lower-cost supplemental plans. For family members, the plan calls for eligibility monitoring, some lower-cost coverage, and surcharges if covered at work. President Obama’s health care act imposes a “Cadillac tax” on full-coverage “platinum” health plans in 2018, a move to control costs by encouraging employers to move toward plans with higher deductibles and more out-of-pocket expenses. It’s not clear whether state payments for retiree health insurance, which are based on the average of the four highest-enrolled health plans, would be reduced if large numbers of active workers, whose premiums doubled in the last 10 years, opt for lower-cost plans. In bargaining, a standard response to a proposed cut is to ask for an offsetting increase. When the largest state worker union agreed to an increase in employee pension contributions in 2010, the agreement included a pay raise in following years. Brown’s plan presumably benefits state workers by making their retiree health care more secure. Costs are said to be growing at an “unsustainable pace.” Worker contributions might strengthen the legal argument that retiree health care is a “vested right” protected by contract law. Meanwhile, the contrast with other workers grows. The number of large private firms (200 or more employees) offering any level of retiree health care dropped from 66 percent in 1988 to 28 percent in 2013, a Kaiser report said. Many California teachers have no employer retiree health care. For state workers who retire early, retiree health care can be a major benefit. With at least five years of service, state workers are eligible to retire at age 50, age 52 if hired after Brown’s pension reform took effect on Jan. 1, 2013. “The plan preserves retiree health benefits when the private sector is scaling back, maintains health plans, and continues the state’s substantial support for employee health care,” the governor’s budget summary said last week. This entry was posted on January 12, 2015 at 9:06 am and is filed under Brown, Retiree health. You can follow any responses to this entry through the RSS 2.0 feed. You can skip to the end and leave a response. Pinging is currently not allowed. Why make the employee pay? This just gives them the argument that this is a vested right. The employees always ask and usually get a pay raise that offsets the new employee contribution and gives the employee a larger income for retirement calculations. The state should just make the payments for health care and not give raises until the bill is paid. Nothing is perfect in this world, but Governor Brown’s plan stands as pretty close approximation. I would note that he hits each point in the triangle of solutions that I promised in 2007: continued pay go, pre-funding for part and cost control. Excellent! Yeah, he’ll “fight” for State workers to pay 50% of the total cost of their retiree healthcare? This, from the man who modestly “objected” to just ONE of the 99 ways that CalPERS memorialized to allow “spiking” of their pay for pension purposes. As they say ….. I’ll believe it when I SEE it. Why would he have to show anything to you, TL? You live in NJ. The obligation of the State to pay any retiree health is much less solid than the obligation to pay pension costs. Given the incredible inflation in medical costs, something had to give, and this seems pretty good. The real mess is the US health care system itself… we rank 38th in quality among he 200 or so world countries. Our rate of infant mortality is 56th in the world, and our life expectancy is 42nd in the world. We are only first in the world in the cost per person: we spend more per person on health care than any other country in the world, but the performance of our health care system is in the second quartile. It is really a scandal. Ed,it appears a little misleading when you state “For state workers who retire early, retiree health care can be a major benefit. With at least five years of service, state workers are eligible to retire at age 50,…”. An employee who retires after five years of service is not eligible for retiree health care. Vince, So does that justify giving PUBLIC Sector workers 50% retiree healthcare coverage after 10 years, when those who now pay for almost all of it, PRIVATE Sector taxpayers, rarely get ANY (yes ANY) employer-sponsored retiree healthcare benefits even if they work 20, 30, or 40 years? Complete elimination of ANY taxpayer subsidy is what’s called-for, justifiable, and fair to taxpayers. The CB process is the only way to get some of these costs down. In the meantime, how about trying to work with the insurance companies, who provide the PPO coverage to negotiate reasonable premiums. When the employer-provided coverage for the retiree is only secondary to Medicare and the premium is more than that for an active employee, something is not right. Yes, but 95+% of those “retirement benefits” you speak of are NOT Retiree healthcare benefits, but 401K Plan contributions (and not the grossly excessive Public Sector DB pensions that are ROUTINE in the Public Sector … but thats for another comment). TODAY, it is VERY rare for Private Sector workers to actively be earning ANY employer-sponsored retired healthcare benefits (beyond perhaps a $300-$500 annual employer contribution into a retiree healthcare HSA). So is your only “answer” to the fact that only the Public Sector gets rich (free or heavily subsidized) retiree healthcare, that such benefits …”should be standard throughout the country”. Earth to Vince ….. do you think Private Sector employees have the stranglehold on THEIR employers and can simply demand it (even if they belong to a Union … that doesn’t benefit if they “kill the host”) … as do Public Sector Unions/workers, and with the beleaguered and betrayed Taxpayer as the payer-sucker in the equation ? Let’s cut to the chase. Public Sector workers ONLY get these generous benefits, as well as pensions that are ROUTINELY 3x-4x greater in value at retirement than those of comparably situated Private Sector workers …… who retire at the SAME age, with the SAME pay, and the SAME service years …… because the Public Sector Unions COLLUDE with our Elected Officials to grant it. Specifically, via trading of Public Sector Unions campaign contributions and election support for the favorable votes of our self-interested, vote-selling, contribution-soliciting, taxpayer-betraying, Elected Officials on Public Sector pay, pensions, and benefits. And your pay raise follow-up is more of the BS we hear so often, In all but the highest level professional occupations Public Sector “cash pay” alone is equal to or greater than that of their Private Sector counterparts. With equal Public/Private Sector “Total Compensation” (cash pay + pensions + benefits) as a reasonable goal, there is ZERO justification for ANY greater Public Sector pensions (let along ones that are routinely 3x-4x greater today) or for ANY taxpayer-subsidized retiree healthcare coverage….at all. FYI ….. 85% of all jobs reside in the PRIVATE Sector, so it’s THAT Sector that sets the standard for “Market Rate Compensation”, (NOT the 15% of all workers in the Public Sector). That the Public Sector has gained material advantage by such underhanded means (“racketeering” if Corporate conduct) amounts to a theft of taxpayer wealth. Taxpayers would be eminently justified in reneging on the 50%-75% share of Public Sector pensions (and 100% of retiree healthcare subsidies) that would NOT have been granted in the absence of the Public Sector Union/Elected Official collusion. And they should do so by refusing to fund these outrageous Public Sector pension/benefit “promises”. Not necessarily. and even with Medicare as Primary and picking up 75% of covered costs. Healthcare Claim costs rise (faster than linearly) with advancing age. It is not at all unreasonable for average costs of a retired population to be more than 4 times that of the “active” population. The younger the average age of the “active” population (or the older the average age of the “retired” population), the more pronounced the differential in average costs. Also, as evidenced by insurance company statistics, when one is not actively employed (e;g;, retired, for example) they see more doctors because not just because they have more health issues, but just because they have more time to do so. That’s not “free”, and insurance companies price for anticipated claims, regardless of why they occur. Another way to make money available to help pre-fund retiree health care is a lifestyle penalty for some employees. Employees who smoke or are obese solely due to overeating/inactive lifestyle should pay more because they tend to develop expensive chronic conditions. This will encourage them to make better choices, improving the risk pool and eventually the HMO’s would lower the rates for all. Would these proposals affect current retirees? Or would it be grandfathered in? A common sense solution is to eliminate all state income taxes for, state, county and municiapal employees. They can fund the pensions and health care going forward to maintain their defined benefits. They probably should be exempt from sales taxes as well. I don t want any reductions,in taxes for others, and more than comfortable letting them fund thier own plans. I am sure some modification can be negotiated, but the point is to let them fund thier own plans, and other state govt funding would be frozen at current rates. Any change to the current rates would be by referendum to all voters. Stuart mills, So let’s see, so far you have recommended that, in exchange for the workers funding their own pensions & benefits (the latter of which I assume you mean retiree healthcare costs), Public Sector workers should pay no State Income taxes (which would include taxation on overtime payments) or Sales taxes. Lets assume the total “forgiven taxes” comes in on the under side of 20% of pay. Now tell me, how is that fair to comparably situated Private Sector taxpayers who typically get ZERO employer-sponsored retiree Healthcare benefits and rarely get more than 3%-4% employer contribution “match” into a 401K Plan? Are Public Sector workers “special” and deserving of a better deal … on the Taxpayers’ dime ? Sure it is fair, all the current underfunding would belong to them. If they want to lower the retirement age, it belongs to them. The state’s contribution would be fixed percent of pay only changed at the ballot box. The employee contribution would increase by the amount needed to fix the underfunding, 50 percent of it. The taxed citizens would pick up the rest. Calculate the fix over ten years, this also reduce pension checks. This is more than fair. The average govt employee would experience an adjustment to take home pay with the increases from tax savings offset by retirement contributions. If the underfunding persists because of increased lifespan, poor investments, it is the responsibility of the govt workers to make up the difference. This would make a superb, but complicated ballot measure. There may be tear jerker stories where a govt employee gets a paycheck for $3.38 after deductions, but they should have a good retirement to look forward to. Let’s just keep the public and private sectors separate, TL. Your harping on it is getting tiresome. Each sector should administer itself. Both sectors have unions. Its up to the, respective, entities, both public and private as to how they will treat their employees regarding pay and benefits. I don’t know how health care debt can be prepaid, because nobody knows what the debt is going to be–the premiums keep rising..and rising. I can see some negotiating, whereby a special rainy-day fund is established to draw from for health care costs. It would make sense for each entity to establish the parameters for its own health care fund, since there is no uniform policy for providing medical care benefits to workers and their dependents. Thank you, Seesaw. Of course you are also describing the out of control pension costs, aren’t you? I guess you do understand … even if it’s only when “you think” it benefits your own lousy arguments. The rest of your comments, time stamped January 13, 2015 at 3:57 am, are sad. No. The pension plans are established with formulas that are known and legally passed. I don’t feel too sad that you think I make sad comments. At least I am a stakeholder. A disgruntled citizen who is upset because he has to pay taxes to support his public services is sad…..,,. THAT is quite a statement … even from someone as air-headed as you ……. considering that almost all that the “Public Sector” promises it’s workers, is paid for by taxing PRIVATE Sector.workers. The root problem remains: the US has the most expensive health care system in the world which provides third-tier quality compared to the rest of the world’s more economical systems. If we Americans could just get what we pay for out of that system, all these worries about retiree health care funding would be moot. Good book by Steven Brill on the whole subject, recently released. One odd twist: due to the way premiums are computed, young people subsidize older people because young pay about the same premiums receive far less in services. Young people numerically pay for a portion of their future services through this mechanism. But on average they never get those services, and the insurance industry pockets the funds as profit. A simple solution is: young people’s extra payments should be banked as an invested fund for future use. Common mistake by financial planners, budgeters, forecasters and analysts: take current trends and extrapolate them into the future. It’s human nature but is always proven wrong. Anything that steeply ramps up never maintains the steep climb indefinitely. The trend always levels off or declines. The future seemed so bright for homes in 2005, stocks in 1999, oil in 2014, tulips in 1637 … until the party ended and the trends reversed. The same goes for health care costs. The upward trend is unsustainable. As costs rise and become unaffordable, a disruptive event will occur — government intervention, new business model, new technology, etc. — that will drive costs down. The most likely outcome for Brown’s prefunding plan is that it will eventually go into surplus once the health cost bubble bursts. Everybody gets taxed TL. There is no financial grouping in the public budgets for private sector workers and public sector workers. Talk about “airheaded”–Look in the mirror TL..
Don’t know what your’re talking about Spension. My premiums are higher than the premiums for the younger ones–I am paying my premiums, except for the capped stipend that will stay fixed until my former employer finds a legal way not to pay it. Just another case of older generations, who were better off, taking too much and refusing to pay for it excluding themselves from the sacrifices. And sticking younger generations with the bill. Since the retired and soon to retire didn’t pay in anything up front, how about having them kick in for health insurance now? And the big issue is health insurance before Medicare picks up most of the tab. Those retiring at 50 or 55. They should pay more. Perhaps those that don’t retire until 65 shouldn’t have to pay at all. What you are describing is correct in employer-sponsored (i.e., “group”) coverage, but not individually purchase coverage (except via Obamacare where there is some cross-subsidies to make it work). But while there ARE such cross-subsidies in employer-sponsored Plans, it would be extremely rare even for the healthiest/youngest worker not to be getting coverage relatively cheaply …. i. e., cheaper than they could buy on their own, individually. This is because most employers pick up 60-75% of the Plan’s total cost. I give that about a 2% chance of happenning because it is EXTREMELY unlikely they will really accumulate any materiel amount, and if they do, assuredly the next politician will find a way to spend the money on his/her pet project. SeeSaw, If your “capped” stipend were ZERO, you would get the SAME as most Private Sector retirees …. because they typically get NOTHING. Please explain why YOU (and hubby) are “special” and deserving of a better deal … a good portion of the cost of what YOU get, on the Taxpayers’ dime? And ..being an “airhead” … you didn’t even understand Spension’s point. Hint … you may be paying MORE than a younger person, but the differential should be (from a cost-of-coverage-standpoint) even GREATER than it is. larrylittlefield …. we agree !!! Public Sector who retire before age 65 (and eligibility for Medicare) should pay for 100% of the coverage…. THEMSELVES ! TL says: “This is because most employers pick up 60-75% of the Plan’s total cost.” …. sure, but every compensation study I’ve ever seen levels this contribution out. In one sense the employer is putting money in for young people that could be characterized as a investment for the young person’s health care benefits in old age. It is less clear than what happens to the employee contribution, though. And yes, employer-based plans are my main example, although I’m not sure how much payments increase with age in individually purchased insurance, particularly now in the Obamacare era. Of course, Medicare is entirely different. In any case, the root problem remains: we get underperformance out of the US medical care system; it is the most expensive per capita in the world but only in the second quintile or so in performance. I think every other concern is a distant second to this root problem. SeeSaw, I didn’t say that you did anything “wrong”, only the you indeed ARE the recipient of unjust and unfair advantage (via a far greater pension and much better benefits than comparable Private Sector workers who pay for most of YOUR pension & benefits get) that would NOT have been granted the absence of the COLLUSION between Public Sector Unions and the Elected Official’s they BUY with campaign contributions and election support. I’m not sure if you see that but refuse to accept it, or don’t see it all all. Connect the dots, SeeSaw. – and yet the premiums keep rising … and rising. How is it any different, Seesaw? Maybe you can give my comments some thought before you start typing? I think the unions end-game is to pay a portion of their retiree medical for the sole purpose of being able to claim the benefit is a vested right. The next rebuttal will be the private sector greed and wall street are to blame everyone doesn’t t have the pension SeeSaw has. Predictable, yes. Open to other views, no. The pendulum is in one diection now. There will be change. What is predictable is that the beneficiaries now could care less abou what follows. greed appears without fail in history; it is not always private sector and wall street, to quote someone. tough wrote “..Private Sector workers who pay for most of YOUR pension & benefits …”. Are you creating your own “facts”that aren’t? For CalPERS, 67 cents of every dollar that is spent on public employee pensions is from INVESTMENT EARNINGS, 12% from employees themselves, WHO PAY TAXES, the rest is earned from the employers, about 21%. Period. And guess what, the public employees’ portion is going up. The health benefits that are earned through employment as a deferred benefit will still not qualify your false statement that private sector workers pay MOST of the pension & benefits. Are you awake yet? Vince, I suggest you take financial economics 101. There are ONLY 2 sources of funds to pay for your pensions, the workers and the taxpayers, Investment income only adjusts for the “time value of money” and is not a “source” of funds to pay for your pension, but rather lost investment earnings that, in the absence of the workers & taxpayers need to pre-fund your pension, would have stayed in the respective contributors pockets …… which in the case of the Taxpayers, perhaps to help fund their much smaller pensions. If you were to accumulate ALL of your actual pension contributions (INCLUDING the investment earnings thereon) to the date of your retirement, RARELY would the accumulated sum be sufficient to buy more than 10-20% of your VERY generous pension. The 80-90% balance comes from Taxpayer contribution and the investment earnings thereon. But nice try, some readers are still ramping-up on the learning curve and might believe your BS. Vince, other than, maybe, the public employee share of pension contributions may slightly increase nothing you’ve stated is true. Even if the employee cost should increase slightly, and there is a CAP on the amount, the taxpayer burden continues to escalate a rate multiple times the pittance employee pays without a CAP in sight. I think taxpayers would be more than happy to allow people such as yourself to take complete ownership of your own pension plan and all the crap that comes with it. tough, I’m pretty sure not much has changed since the econ 101macroeconomics class I took 25 years ago, but thanks. It seems in your world, pension and retiree health benefits are a one time lump sum payment. And I’m sure you’re against the GI Bill college fund, against Nevada giving tax credits to Tesla, etc. Yup, you’re against the government investing in their employees and citizens. Got it, clear as a bell. Privatize ALL services and let the users pay, right? Let me know how that works, will you? As far as dismissing investments earnings, pal, you’re gonna need to take a far more basic class than econ 101. Like a treatise on capitalism and how money works, period. Captain, as far as you writing that nothing else I wrote is true, what? So public employees DON’T pay taxes? Really? That is going to be very, very welcome news to a LOT of people. Not true, but who cares. Etc. Vince, Nice try .. again …. but we BOTH know what you stated is BS. This is good news to all — except to pension alarmists. They don’t like good news, it makes it harder for them to spin their doom and gloom. TL and Captain are just two malcontents who can’t stand to see anything run smoothly in the public sector. They don’t debate–they just insult. BBtWPA, you bring mixed news. “CalPERS is now 77% funded, up from 70% a year ago.” With the Dow at a record high, I would expect this ratio to be in excess of 100%. This is an alarming statistic. “CalPERS earned 18.4% over the last FY, more than double the 7.5% target.” This is very good news! Sure, it is good news that CalPERS made money next year. However, decision making based on any one year of returns is unwise… when pension funds were overfunded in the 1990’s, really, really bad decisions got made. I seriously doubt it. Even if that were true it’s probably only because taxpayers are paying 3-4 times the “normal” rate which provides more funds to generate investment earnings. And that has nothing to do with CalPERS actually being an efficient organization/ investment vehicle, or even a worthy government organization. Also, the statement that, “67 cents of every dollar that is spent on public employee pensions is from INVESTMENT EARNINGS” is probably subject to a great deal of fudgeability. Besides, with taxpayers paying about 75% of pension contributions (over 50% of payroll in many cases), which generate 75% of the investment returns, it is clear that they’re paying more than they should. Hmmmmm. Who should I believe ?? S Moderation Douglas, Looks like you (intentionally) neglected forgot to mention that the Public Sector workers in the Professional and PHD categories equate to Private Sector workers (in those groups) that total only 3% of the entire Private Sector workforce. As a Public Sector retiree collecting one of these excessive pensions, you are clearly trying to find support, no matter how meaningless, for your agenda … leave our fat/excessive pensions alone. And throw in the Masters group, and it’s just another 8% of Private Sector workers ….. big Woop. I am indeed a state retiree. And proud of it. It was a good and productive career. You may have noticed that I have never impugned your motives, as some other posters have. Not because I’m a nice guy, ( though I am, of course) but because it is counterproductive, and childish. I will, however, challenge your logic and your “version” of the facts. Both those statements are entirely true…and totally irrelevant. Your claim is, and always has been that, except for a “few” at the highest levels, cash pay in the public sector is equal to or higher than in the private sector. Briggs and Richwine, and every other major economic study have said exactly the opposite. It is the one fact upon which they all agree. State workers earn less than private at every level. The lowest level state workers earn about 3% less, and the highest level earn about 37% less. The average is 12% less. Similar studies for local government workers have always shown the same tendencies. Although they may disagree by a few percentage points, local government workers also earn less than the private sector. Here again, the lower level workers are “nearly equal” in cash pay, and the higher levels of public workers have a much larger pay deficit. I would even include that cash pay in the public sector is equal to or higher than in the private sector at the highest levels. How many private sector employees making over 200K per year also receive overtime, don’t fund staff, and have no office rent – while receiving lifetime pensions well into the six-figure range and also lifetime medical benefits. And how much paid leave is calculated into those costs, which are compounded by the snumber, as ridiculous as they are, of compensated leave public sector union members receive? We are talking about California Public Employees aren’t we, SDouglas. Do the studies even include the recent pension cost increases, or the the soon to be implemented cost increases of pensions over the next 7 years? And do they include the cost increases associated with the 72 BILLION in unfunded retiree Health Care debt? And won’t that 72 Billion in retiree health care debt actually cost something north of 300 Billion? I can’t wait for our Ca. government agencies to start reporting actual numbers; debt numbers not hidden in footnotes but about to be placed on the balance sheet..
…and the 72 billion in unfunded health care liabilities, for entire families, is only referring to the states mess. On top of that Ca taxpayers are stuck with an even higher bill to cover the unfunded health care liability of County workers, city workers, and special districts employees. Taxpayers deserve much better considetring their extremely high tax rate. Actually, they deserve much better period! If you can opt not to believe several concurring studies by academic economists who all agree that public workers earn lower cash wages…much lower, in many cases, then you might as well be in denial about this, also. Your taxes are probably not as “extremely high” as you might think. Many of the so called “low tax” states are low tax only for the highest income groups. Lower income groups in those states actually pay a higher percentage of income in state and local taxes than than the national average. California is the opposite. If you earn less than $100,000 a year, your combined state and local taxes are probably lower than the national average. And while your not believing that, you can also not believe that California’s public employee costs are “average”. “CalPERS researchers using U.S. Census data found that employee compensation is a slightly smaller part of total state and local government spending in California than the national average, 30.92 percent compared to 30.98 percent. Three sequential denials. That would be the denial hat trick. Well, now you’re really scraping to bottom of the barrel …. and by far the MOST biased and unreliable source … CalPERS. Weren’t they they ones who said the 50% SB400 retroactive pension increase would cost taxpayers NOTHING? Yet you never seem to post the MOST important one … FROM THAT STUDY … from Figure 13, that CA “Total Compensation” in the Public Sector is 33% higher than that of comparable Private Sector workers … and still 23% higher even if the incremental value of “job security” is removed. Why is that … your bias & agenda ? TL, aren’t you a pot calling the kettle black? That’s 12.4% of the nations welfare spending. “a slightly smaller part of total state and local government spending in California than the national average” actually is probably due to the fact that California has fewer public employees per capita than all but five other states. If I may answer a question with a question; why do you believe the “33% higher” figure, but not the fact that almost all public workers earn less cash pay? Oh surely you didn’t miss my comment time-stamped January 16, 2015 at 6:52 pm NA January 16, 2015 at 7:13 pm. What, no attempt to justify that too ? “As workers in the private sector struggle with stagnant wages, disappearing benefits, and rising retirement ages, unionized public employees retire in their fifties with over $100,000 a year in pension and healthcare benefits. The unions defend tooth and nail the generous compensation packages and extensive job security measures they’ve won for their members. However, the costs they impose crowd out important government services on which the poor and the middle class rely. Attempts to rein in the unions, as in Wisconsin and New Jersey, have met with massive resistance. Yet as Daniel DiSalvo argues in Government against Itself, public sector unions threaten the integrity of our very democracy. DiSalvo, a third generation union member, sees the value in private sector unions. But in public sector, unions do not face a genuine adversary at the bargaining table. Moreover, the public sector can’t go out of business no matter how much union members manage to squeeze out of it. Union members have no incentive to settle for less, and the costs get passed along to the taxpayer. States and municipalities strain under the weight of their pension obligations, and the chasm between well-compensated public sector employees and their beleaguered private sector counterparts widens. Where private sector unions can provide a necessary counterweight to the power of capital, public employee unionism is basically the government bargaining with itself; it’s no wonder they almost always win. The left is largely in thrall to the unions, both ideologically and financially; the right would simply take a hatchet to the state itself, eliminating important and valuable government services. Neither side offers a realistic vision of well-run government that spends tax dollars wisely and serves the public well. Moving beyond stale and unproductive partisan divisions, DiSalvo argues that we can build a better, more responsive government that is accountable to taxpayers. But we cannot do it until we challenge the dominance of public sector unions in government. Try to relax. We have all year. I didn’t miss your comment. I was otherwise engaged for a short while doing retiree stuff. And don’t call me Shirley. I deduce from your comment that you do not consider CalPERS a reliable source. How ironic you put that in the same post where you characterize SB400 as a “50% pension increase.” No matter how many times you repeat that, the 50% increase was for safety workers only, and even there it was only 50% for those very few who actually retired at age 50. “You never seem to post……yada, yada,….CAPS LOCK….. “33% higher”, etc. “If you read Biggs and Richwine, as I strongly recommend, please read carefully, and reread, all the text and methodology before you get to the lazy reporter bait bar graphs that show California state workers have a 33% compensation advantage over private sector workers. “lazy reporter bait bar graphs” means one quotes the most dramatic stats out of context. There…..I mentioned it. And I still highly recommend reading the study….the whole thing, not just the graphs. Douglas, What guild were you a member of? As I expected, when asked to respond to the source YOU like to quote, when it show something MATERIALLY contrary to your agenda …… which is helping to keep your unjust, grossly excessive pension in place by trying to convince readers that CA’s Public Sector compensation is not excessive….. you punt, and all you can come up with is the pitiful response that (ALL OF A SUDDEN) that great reference you like to quote is …. “lazy reporter bait bar graphs”. From Figure 13,…… CA “Total Compensation” in the Public Sector is 33% higher than that of comparable Private Sector workers … and still (per Figure 6 of that Study) 23% higher even if the incremental value of “job security” is removed. Your bias & agenda is showing. It would help if you went to the CalPERS site for your stats, TL. Your statement that public workers retire in their 50’s with $100,000 pensions is a bunch of BS! Facts are: The average age at retirement of all CalPERS retirees is 60; the average retirement amount for all retirees is $2700/mo. – Who does? CalPERS promoted the biggest give-away of taxpayers dollars in, probably, our states history. SB 400 is the root cause of much that ails every single level of California budgets. Period. Regarding CalPERS, the make-up and actions of the Board of Administration is bordering on criminal. The former CEO of CalPERS is waiting sentencing for corruption. A former Board of Administration member, who was complicit in the fraud – along with the CalPERS CEO, just committed suicide three days ago. The current CalPERS Board of Administration can’t seem to do anything that doesn’t benefit themselves and their union member personally, while at the same time trying to defer any and all costs as far out into the future as possible. A) they believe taxpayers will have to pay for every single dollar owed to anything considered a vested right (by themselves). B) the more debt that can be deferred means more money for pay increases, even if it only compounds the larger problem. The unions are concerned that if wages don’t increase the natives will get restless, and the union bosses won’t get their bonuses. C) The CalPERS Board of Administration is a COMPLETE and TOTAL JOKE. Governor Brown has acknowledged the need to reform the Board – but I guess he’s just too busy to tackle the issue, or even challenge the CORRUPT CalPERS Board of Administrations gutting of his Pension reform. What a lack of leadership on his part. The CalPERS Board of Administration, collectively, based on their lack of performance, isn’t even qualified to manage their own 401K’s. While there are some on the CalPERS Board of Administration that are experts in their field (maybe 3 or 4) they need to start speaking up. – Why are using total state & local government expenditures to make your argument? Why not use the General Fund that most of the employee costs come from? I know, it would blow a hole in your entire argument! Because California has more total expenditures than any other state … your argument reminds me of what the Vallejo Unions tried to pull during their bankruptcy. They claimed their cost was much less when viewed in the context of the entire city budget, while lobbying to use restricted funds such as water as way to pay what their general fund couldn’t afford… Fortunately the Judge shot their argument down. I hope you and your friends are happy that our school district budgets, which already have almost zero discretionary funding, will be bombarded by rate increases from CalPERS & CalSTRS. Good for you! – Seesaw, the conversation has moved past your stale comments. “The CalPERS chief actuary says pension costs are “unsustainable,” and the giant public employee pension system plans to meet with stakeholders to discuss the issue. – What ever happened to Ron Seeling? A local reporter commented that he requested an interview but was told Mr. Seeling was unavailable. Why was that? Did CalPERS use taxpayer funds to pay for his silence or did he fear for his life? – Those numbers represent a bargain based on the standard cost, “normal cost”, of about 10 percent for Misc. employees and 17 percent for safety employees. But the 25 percent for Misc. employees and the 40-50 percent for safety employees is boat loads less of taxpayer dollars than the projected rates of as much as 40 percent for miscellaneous employees and as much as 70 percent plus for safety employees. I other words, what were unsustainable costs just a few years ago are now increasing by another 50 percent. And that doesn’t even include the soon to increase Family Medical Plans we’re about to get stuck paying for – for people retiring in their fifties, with six figure pensions. Maybe we should all agree to tax ourselves some more to help pay off the mortgages of these public employee union gods. – While I’m at it, what ever happened to the two CalPERS analysts that were terminated for challenging the pension payouts of CalPERS Members? Were they paid off too – to go away and never rock the boat? – that probably doesn’t even include the yet to be implemented: 25% increase in miscellaneous employee pension costs, the 50 percent increase in safety employee pension costs, the 150 percent increase in school district classified employee costs. And it doesn’t include the proposed increase in taxpayer costs for non-vested retiree healthcare costs. Captain, You are correct that the correct % is likely much greater than 33%, but not only because it is based on a data-period before the massive increases coming, but also because the study ONLY included Misc. State workers. This group (which excludes all County, and local workers, as well as ALL Safety workers) is the LOWEST paid of all the groups, and represents only 10% of CA’s total Public Sector workforce. It would be MUCH greater with ALL of CA’s higher-paid Public Sector workers included. And interestingly, S Moderation Douglas was alerted to that issue a while ago by a California Transparency Project Researcher, but (since it doesn’t support his agenda to keep these overstuffed plans in place), he conveniently forgets to mention it. Tough Love opinion, again. Often in error. Never in doubt. In 2010, the Center on Wage and Employment Dynamics issued a study on all full time California State and local workers (including safety). They concluded that the government workers wages were about 7% less than equivalent private sector wokers. Andrew Biggs, Wall Street Journal, Feb 24, 2011. Biggs continues to say that “Using essentially the same methods”, he found state and local wages 4% lower. Transparent California appears to be making two of the rookie mistakes that Biggs and other economists caution against. 1) Comparing “average” salaries between public and private sectors. 2) Comparing pay between public- and private-sector workers in the “same” occupations. Transparent California compounds the error by confusing and conflating “total compensation” , “wages”, overtime, “other pay”. “Hundreds Of California Government Employees Are Paid Over $400,000 A Year . Transparent California says they are not responsible for the way third parties misuse their information, but one would hope they would try to correct any misleading use. Unless, of course, that was the plan all along. So, yes, I was “alerted to that issue” and Transparent California continues to mislead the public and the media. -Captain, the conversation has moved past your stale comments. Ok, “wages”, that’s ONLY “cash pay”. but CA Public Sector “Total Compensation” including pension and benefits is 33% HIGHER and with the 33% based ONLY on the LOWEST-paid 10% of CA ‘s Public Sector workers is assuredly much higher if ALL of CA’s Public Sector workers were included. THANKS … for mentioning this and giving me the incentive to challenge MORE of your distortions, material omission of facts, and outright lies. You’re welcome. I’m here to help. Does this mean you will finally stop writing “In all but the highest level professional occupations Public Sector “cash pay” alone is equal to or greater than that of their Private Sector counterparts.” ? S Moderation Douglas, Does that mean whenever you mention that Public Sector “wages” (alone) are lower than those of Private Sector workers that you will always include with that comment that on a “Total Compensation” (wages + pension + benefits) basis, PUBLIC Sector “Total Compensation” is far greater? I’m glad you answered that question with another question. (Sometimes known as the elenctic method). “”Total Compensation” is far greater” is your interpretation. According to Biggs, in national statistics, average employees have a total compensation premium of around ten percent relative to the private sector. Again, in national statistics, the lower level public sector workers (HS grads) have a “far greater total compensation” (19% greater) than private sector HS grads. But, in the lower levels, in nominal dollars “far greater” translates to about $10,000 a year. At the PhD level, “far lower” translates to over $32,000. Public sector HS grads make $10,000 more than private sector. Public sector PhD s make $32,000 less. Yes, I am aware I was referring to national averages. In California (and New Jersey) the average total compensation, as per Biggs, is 23% higher, not 10%. But Biggs doesn’t break down the pay by educational level for each state separately. The same principle applies. Lower levels are overpaid and upper levels are underpaid. Its then a matter of degree. S. Moderation Douglas, Let’s dig in a bit to the $32K Private Sector Total Compensation advantage for the “PHD” group you like to keep shoving out their as thought it were meaningful. First, the statistics you quote (from the AEI Study) show that we are comparing 4% of all Public Sector workers to 1% of all Private Sector workers. So to begin with, based on size and contribution to the whole, it’s basically meaningless. One would think a very disproportionate (i.e., LARGER in this case) share of Private Sector Super-Earners, those making Millions or Tens-of-Millions annually fall into the PHD group ,,, without any comparables in the PUBLIC Sector.. Does it not distort the results? Perhaps sufficiently that if they were removed, there would be no difference at all between the PUBLIC/PRIVATE Sector PHD compensation. And perhaps, noting that ONLY the PUBLIC Sector PHDs get those extraordinarily rich pensions & benefits, PUBLIC Sector PHD Total Compensation might even be higher, perhaps a LOT higher (not lower) that their Private Sector counterparts. And similar comparisons extend to the “Professional” Group I am aware of several MDs who are SUPER-RICH via building very successful Pharmaceutical Companies. One lives in the biggest house on Star Island in Florida…. worth about $75 Million. Think how the inclusion of his “annual “Total Compensation” in the PRIVATE Sector compensation database must distort the figures, incorrectly suggesting higher Private Sector Pay for “Professionals”. S Moderation Douglas …. let’s classify this under (not “lies”), but either distortions or omission of material facts. “Taking the log of wages before running the regression has been standard practice for decades,”…. One percent of private workers is over 1.19 million PhDs. Four percent of public workers is over 800,000 PhDs. How many does it take before you consider them meaningful? PhDs are only the most extreme example. How complicated is this? Clearly, according to the most conservative study in existence, sixty percent of public workers nationwide are either nearly equal in total compensation, or underpaid. And you want to materially ( 50%+) reduce their pension accruals. It’s a non starter. I suggest readers take a look at a band new book (“Government Against Itself: Public Union Power and Its Consequences” by Daniel DiSalvo), a brief review of which can be found here on the WSJ. If the link will only give you a few sentences and asks you to sign-in to the WSJ, simply pasting the WSJ ARTICLE TITLE (Public Unions vs. the Public) into Google and clicking on the first item should give you the entire review. Tough Love is overlooking the fact that Republicans in California, sometimes in midnight legislative sessions, supported increased union pension benefits. Or that even in Wisconsin, Republicans supported certain unions’ DB pension benefits. So much for `democrat allies’. Lot of public (and private) institutions in the use have modest, well funded DB pensions, which are more economical than the DC benefits Tough Love favors. And DC benefits enrich the same people, through high fees, that got the $24 trillion taxpayer bailout circa 2009 ($24 trillion according to the Special Inspector General for TARP, and no, most of the funds have never been paid back, that is a narrow focus on one small portion of TARP). Tough Love, being in the investment industry, is not averse to scratching the backs of others who profiteer off of DC. But none of this is the root problem with retiree health. There the root problem is that the US health care industry is awful… most expensive in the world, and consistently ranks about 40th out of the worlds’ 200 countries in quality of service, or infant mortality, or life expectancy. Unfortunately, spension, that is true. Both parties endorsed SB 400, which was brought to us from CalPERS, via a big push from the Public Employee Unions (with the help of their controlled Democrats) that felt entitleted to the excess pension funding. That was never their money but they sucked it up in the form of “retroactive pension benefits” (a huge cost) while also having their retirement age reduced by five years for most (another huge cost), while also adding five years to their Family Retirement Medical Benefit (costing about 18K per year – for employee’s that vested after only five years for local governments & special district service). 1) the increased “3@50 pension formula”. 2) the “RETROACTIVE PENSION INCREASES” of that 3@50 PENSION FORMULA enhancement. 3) the lowering of retirement ages by five years for the majority of bargaining groups – “increasing the cost of their pensions further”. 4) the lowering of retirement ages by five years for the majority of bargaining groups – “increasing the amount of years “Retiree Medical Benefits” would be paid by 5 years. ** It should also be noted that retiree medical costs, managed by CalPERS, have increased dramatically. Part of the reason for that is the benefit levels have significantly enhanced over the past decade. In other words, the benefit levels of today are more generous than what was being paid for even one short decade ago. It ain’t all inflation. You know very little about how pensions are calculated. SB400 changed the 2%@60 to 2%@55. It’s just a formula, it’s not “retirement age”. It did not cause many employees to retire five years earlier. Most working miscellaneous employees still retire in the early to mid 60s, just like private sector workers. At age 63, it increased my pension by about 3%. Captain and S Moderation Douglas …. While S Moderation Douglas is correct in saying that the SB400 change from 2%@ 60 to 2%@55 is only a “formula” change, that change CERTAINLY “resulted” in a reduction in the average retirement age, with as Captain points out, additional years of Taxpayer-funded (and VERY EXPENSIVE pre-Medicare age) retiree healthcare costs. A large proportion of workers will not retire until there is no longer an “early retirement reduction” in their annual pension, with that proportion increasing when that reduction adjustment closely approximates it’s true actuarial value (i.e., not subsidized). Another reason for a shift to younger retirement with this change is the effect of increasing per-year-of-service formula factors with longer service. I’m not sure if it applies to the SB400 Plan change under discussion, but the Plan MIGHT have been structured such that if the worker retired at 55 under the older formula, not only would he/she have had their pension reduced by the “early retirement” adjustment, but also, the formula factor might have only been (say) 1.5% or 1.75% instead of the 2% which might have only been applicable if the worker waited until 60 to retire. The 2% @ 55 formula existed long before SB400, because I had it long before that.. SB400 changed 2% at 50 to 3% at 50. The 3% at 60 formula for miscellaneous workers was on another bill in 2001. Further, many entities never adopted 3% at 50 for PS and many more entities, including the State, never adopted 3% at 60 for miscellaneous. 1) the retirement age was reduced from 60 to 55 for miscellaneous employees (you already know what happened for Safety employees). There was no reduction in pension benefits. In other words, the only thing that changed in the pension formula was the reduced retirement age. Of course the cost for the pension plan increased. 2) the reduced retirement age (from age 60-55), increased the retiree medical benefit by five years. So instead of paying retiree medical benefits for five years the new program at least doubled the retiree medical benefit costs. Even though Jerry Brown has stated that local agencies should end lifetime retiree medical benefits at the medicare eligable age of 65, it isn’t happening in most cases. I don’t think the state is even honoring his wishes. What is amazing is that county, city, local governments have been paying employee medicare for decades and cities haven’t been taking advantage of the savings, while many have been paying Cadillac PRICED private medical benefits for their employees, for years. It’s concerning that the Governor had to state the obvious regarding Pensions & Health Care in the first place, and yet nothing is being done. There are no teeth, seemingly, in anything the governor proposed as it relates to CalPERS. – TL, The retirement age, from 60 -55, increased both the pension & healthcare cost. It had nothing to do with any adjustments for early retirement. The changes only had everything to do with increased pension & healthcare benefits – at substantial taxpayer expense.